Bunch the scarf and wrap it all over with plastic ribbons. Display it in a safe container. It’s important that you don’t have any bleach getting on your clothes. You might want to dress up in old clothes for this, just in case! Pour solution of diluted bleach (with water) on the scarf ball. Try different proportion of water and bleach to have different shades. Make sure you turn the bunch over and pour some on each side. Wait a few minutes between each pouring. You will see it change magically in just a few seconds. Once you have a great color change, rinse the bunch with water and put it in a bowl of diluted vinegar. This will fix the color. 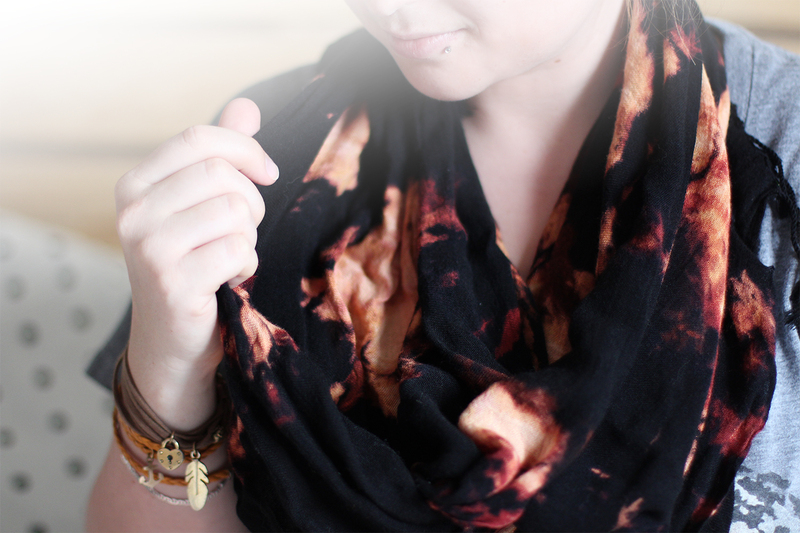 Proudly wear your homemade trendy scarf! There is no garanty of what you will get. As you can see, one of our scarf ended up orange and the other one more yellow. It think this is what’s fun about this project. You don’t know exactly how it will turn out, but the results are awesome! 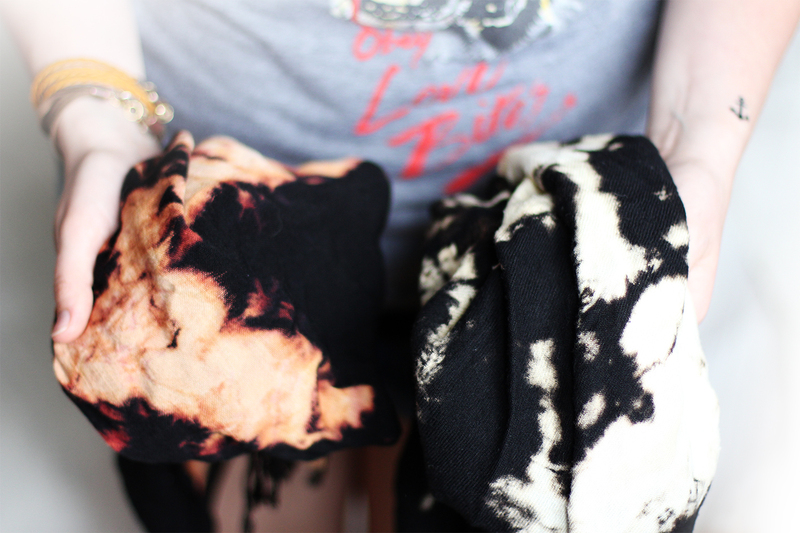 You can now tie-dye everyhting you want as long as you follow the main rule; look for natural fabric! So have you tried making you own scarf? How did it turn out? SO SWELL!! I’ve never been a giant tie dye fan but I might just try my hand at this sometime soon! Notify me of followup comments via e-mail. You can also <a href='http://coloursandbeyond.com/comment-subscriptions?srp=3206&srk=&sra=s&srsrc=f'>subscribe</a> without commenting.